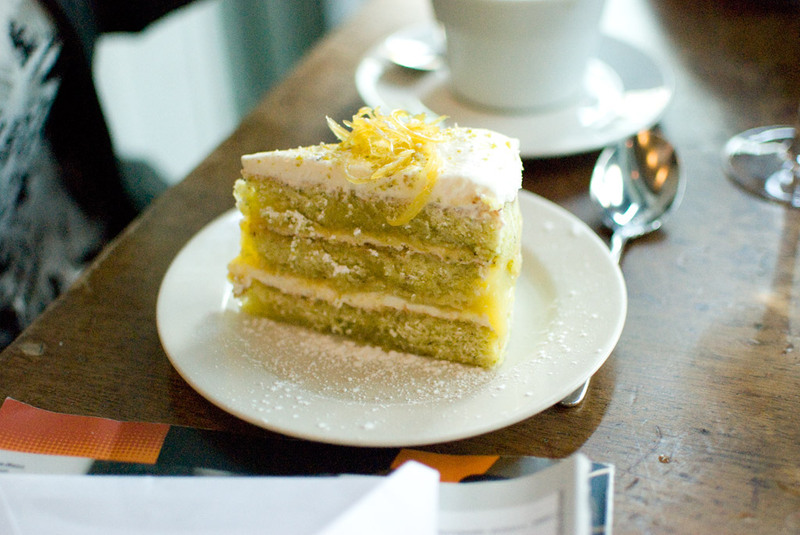 When we say that New York is known for great restaurants, we mean a lot of things. There are the celebrity chefs, and the gimmick restaurants, and the flashy scenes where you go to rub elbows with the glitterati (but the food may not be great). 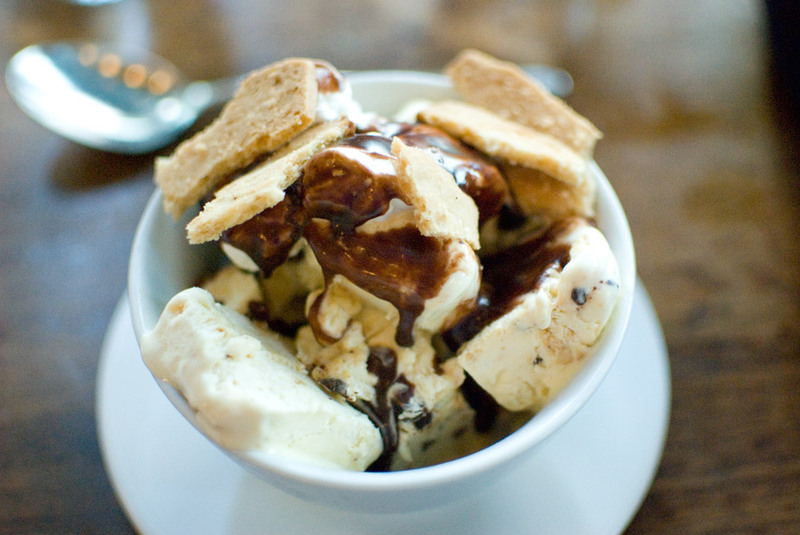 What really makes the city special, however, are the restaurants that are quietly excellent. Barbuto wasn’t even on my radar until i saw Jonathan Waxman on Top Chef Masters (does that make him a celebrity chef? ), where his fellow contestants kept referring to Waxman as the Obi-Wan Kenobi of the group. How could I not want to eat there? When my parents asked me to pick a restaurant at which to hold a joint Mother’s Day/birthday dinner, I spent some time trying to figure out where to go. Suddenly I remembered Barbuto, and made the reservations. Our appetizers started things out with simple, clean flavors. My dad got the vegetable crudi, though requested the anchovy and breadcrumbs be replaced by something else. 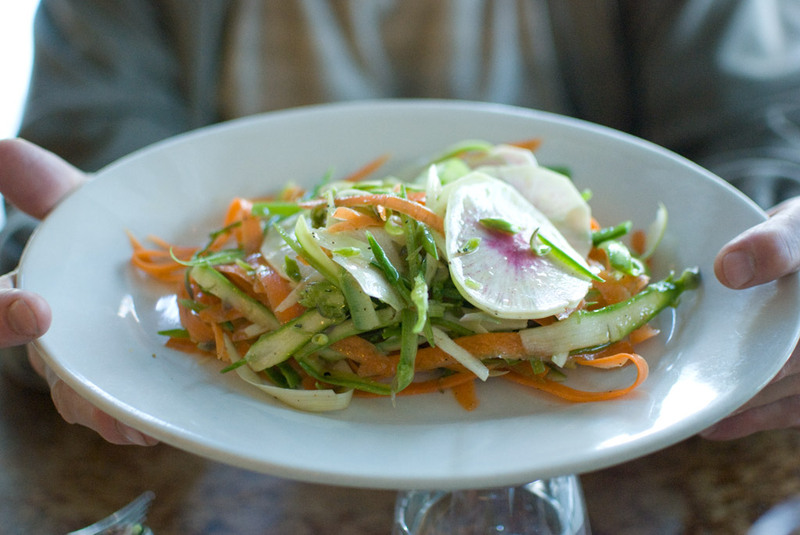 They dressed the thinly sliced vegetables were instead dressed with a simple lemon vinaigrette. 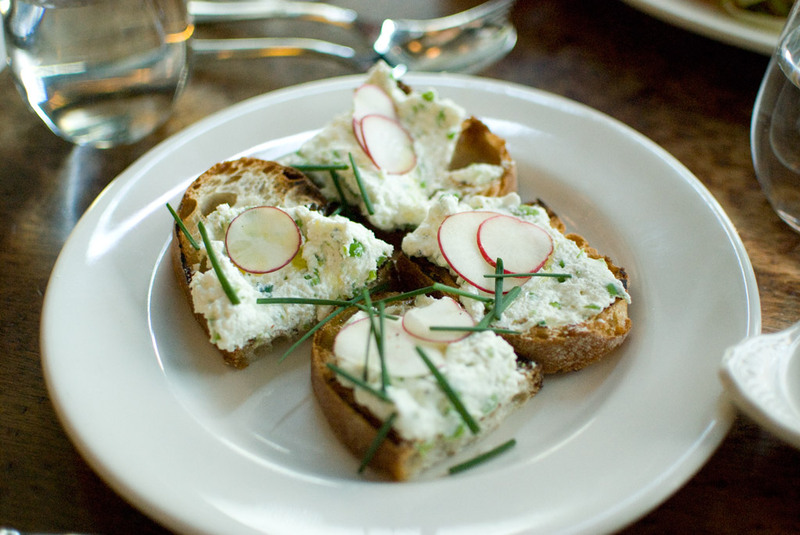 My mom got the bruschetta (seen at the top of this post), the grilled bread in this case topped with fresh ricotta spiked with spicy ramps, topped with thinly sliced radishes. The crudi was a perfect example of how little you have to do with fresh vegetables to make them sing; the bruschetta was a more playful riff on the season, both cooling and hot (in the spicy sense) at the same time. I wasn’t thrilled with my artichoke appetizer, though of course it’s a bit early in the season for them. 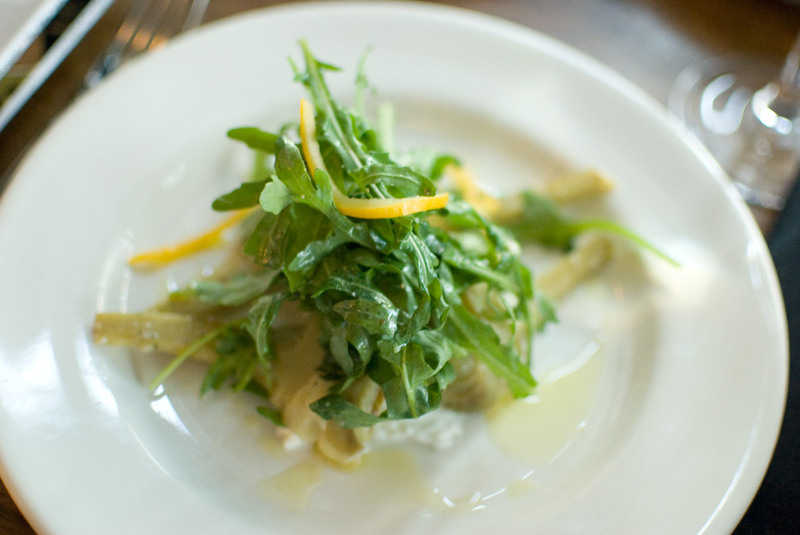 The artichokes were mushy and without flavor, though the dollop of burratta in the center of the salad, underneath the arugula leaves, was wonderfully rich and creamy. 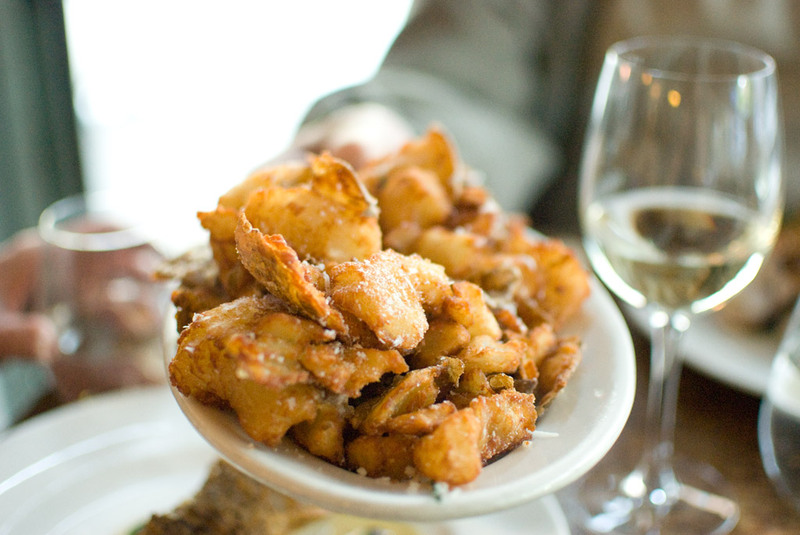 My dad’s side of crispy potatoes, which he ordered as a side dish, were a hit at the entire table. Dusted with cheese and fresh rosemary, the potatoes were salty and crispy without being at all greasy. 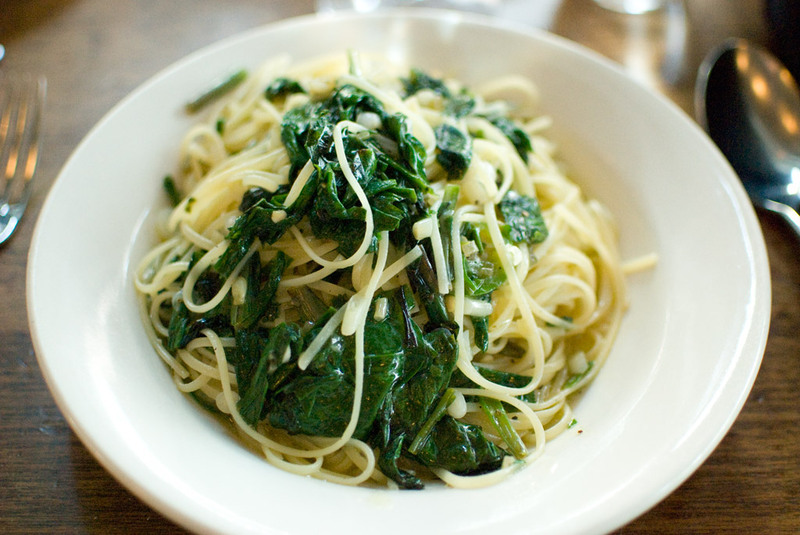 This year I made a vow to try ramps at as many upscale restaurants as I could, since I still don’t quite get what all of the hype is about. My linguinette with ramps, lemon, and chiles was one of the better ramp dishes I’ve had. It tasted almost like something I could have cooked myself, except for the fact that every ingredient was perfectly cooked and perfectly balanced. 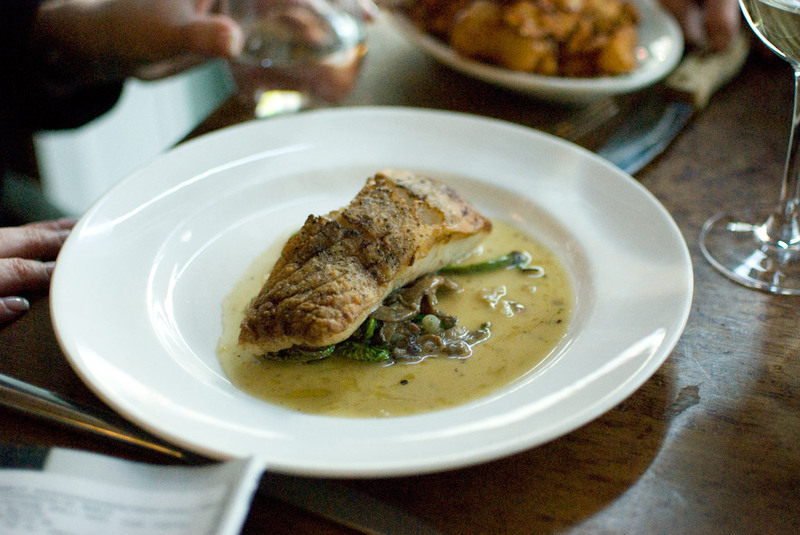 My mom’s cod came served with fiddlehead ferns and morel mushrooms, more spring-specific ingredients. 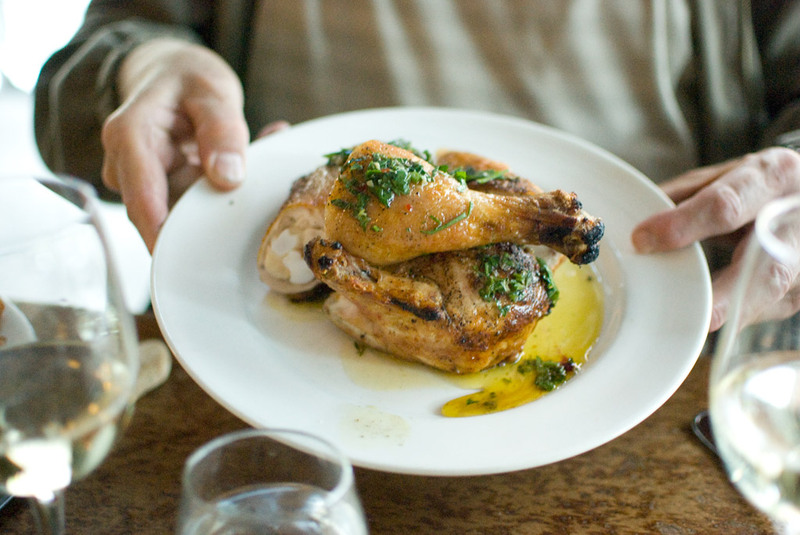 Barbuto is well-known for its roasted chicken, though my dad was not enamored of it. The only part of our meal that wasn’t seasonal was our desserts, but they were still delicious. It’s not that Barbuto is completely off of the radar — in fact my mom spotted Food Network Challenge judge Kerry Vincent dining there the night we were — but it’s certainly not held in the same esteem as NYC’s “great” restaurants. It’s not flawless, but it’s exactly the kind of restaurant that typifies what makes dining in this city so exciting. Fresh ingredients, simple preparations, all couched in an unassuming package. It may sound easy, but I know it’s not — I had dinner at (soon to be closed) Savoy a week later, and though they featured many of the same ingredients, the dinner at Barbuto was far superior.